If you are thinking about designing a website, one of the most important aspects you need to consider are colors. Colors can make a website look sophisticated, complex, and well designed – it’s a problem of mixing and matching hues. Lucky for us, Adobe has made a color wheel that can be easily used by anyone. Now, all you need to do is choose your main color and Adobe makes the perfect match! One of the rules you need to follow is the simple 60-30-10: 60% of one color and another 30% and 10% of contrasting and accents. 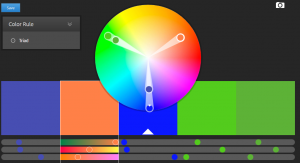 You can visit Adobe color wheel here – Adobe Color and choose your main color and the Triad option – the program does the rest! Now you know what colors you should use so that your website won’t be hard on the eye, but harmonious and relaxing. Also, you might want to look up some of the color properties: there are hard and soft colors, some that make you tired and agitated, some that are calm and induce a relaxing state. Depending on what you want to transmit, you should make sure that you have the right color.